This eye-catching belt buckle is inspired by a popular tattoo design. 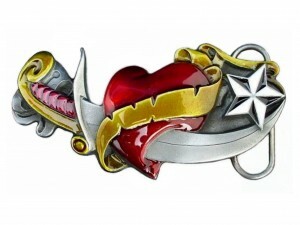 There is a curved dagger piercing a heart with a banner which is balanced on the right hand side with a nautical star. Made from solid pewter and hand finished with red, white, black and amber enamel.